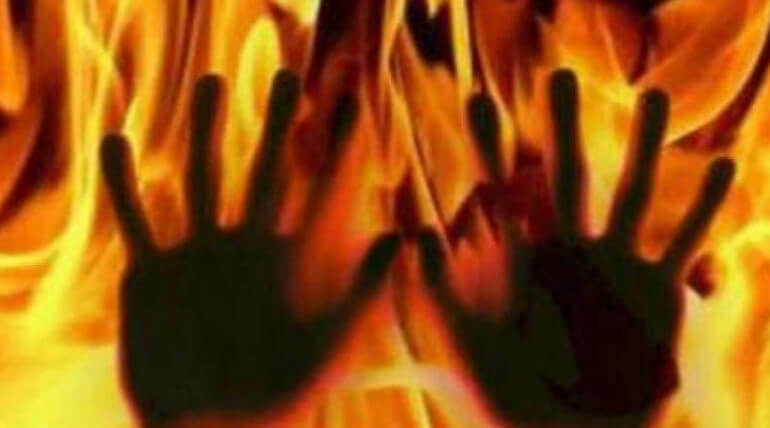 14 years old girl set on fire by an youngster behalf of rejecting his proposal. Chitradevi (14) who is pursuing her 9th grade Government Hr. Sec. school of Achampatty near Thirumangalam of Madurai district has been set ablaze on Saturday (February 17, 2018) morning. She was admitted in nearby Hospital with almost 74% of burn injury. A long time ago, Chitradevi rejected the love proposal of Balamurugan (20), an young man resided in the same area. But Balamurugan followed her wherever she goes and started to convince her. Following this, Chitradevi filed a police complaint over Balamurugan due to his continuous misbehavior actions and made him into the court. As a last attempt Balamurugan again proposed Chitradevi on Valentine's Day but his anger became too worse as she again rejected him. He left the place but today he appeared again before her where she waiting for bus and suddenly he poured petrol on her and set her on fire as revenge. He fled the place immediately. Chithradevi was taken to the nearby hospital by some passerby people who noticed her on burning alive on the street. She is currently under the treatment of third degree burn at Madurai Rajaji Government Hospital. Reports confirmed that Thirumangalam Police had arrested Balamurugan in a small forest near Achampatty who fled the immediate and gone hidden.